Slovenia ranks 18th in the Global Prosperity Index, which has been published annually by the Legatum Institute in London since 2006. This year Slovenia has improved its position in the ranking by 3 lines. The 18th place among 149 countries can be considered as an undoubted success, especially if to take into account that Slovenia has achieved very good indicators, in particular, in the field of environmental protection (1st place) and education (7th place, compared to 22nd in 2017). The London think tank has discovered that global prosperity is gradually increasing, although there is such a global problem as safety and security. Moreover, the gap between the most and the least prosperous countries has widened by 10% as compared to 2013. At the same time, the prosperity of the 20 most successful countries is increasing, while the prosperity of the 20 worst countries is only getting worse. 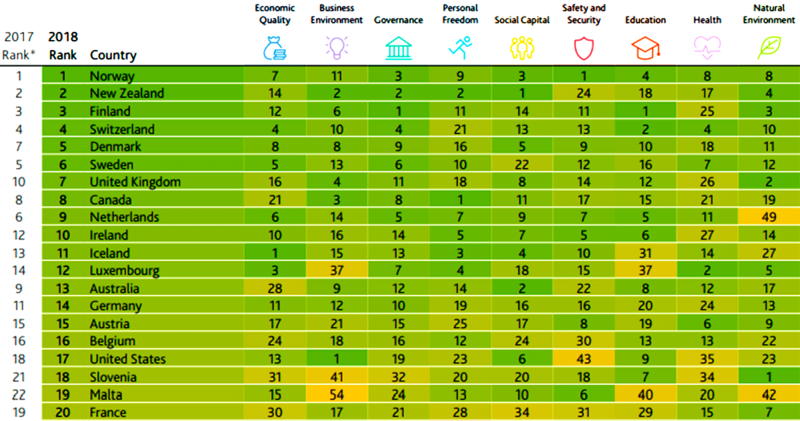 As for the leaders of this ranking, Norway heads the Index for the second consecutive year.